I grew up in literary, bookish household. I love books, reading, nurturing and developing my appreciation for the art form. I read mostly fiction, both contemporary and classic. I really enjoy world literature. I’m partial to women writers and their works, especially African women writers. On this blog, you will find a good mix of reviews and commentary on novels, short stories and poems. I also discuss issues relating to literacy, audience development for the literary arts , which translates into the perennial rant on the state of reading in Ghana and Africa. Periodically I will post off-topic, especially if there is a continental or world football tournament. Otherwise, it’s books, poetry, reading and books! Basically, Kinna Reads reflects my reading life. I live in Ghana, West Africa. 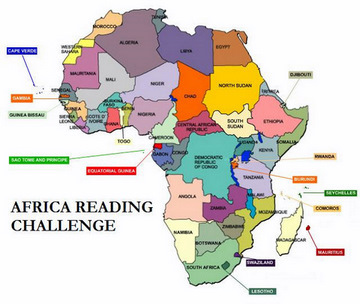 And I host the Africa Reading Challenge, so sign up! You can contact me at kinnareadsATgmailDOTcom. Impressive. This blog is an inspiration. I am completely awed by this. Meaning, I am your new catch… Let’s go! I am glad to have finally discovered your blog! Glad you come by the blog. I hope you find something enjoyable here. Hey Kinna! I just wanted to let you know that I have nominated you for the Liebster Award! To find out what the Liebster Award is all about, head to my post here at http://lulubellaloveslife.wordpress.com/2014/05/13/liebster-blog-award-nomination/ Congratulations! Thank you. I will respond or, rather, answer the questions in due course. Hello there Kinna! I just tuned in randomly. I also enjoy reading about Africa…one of the best books I read in 2013 was Steve Bloomfield’s Africa United, and I just finished reading Fantasia by Assia Djebar (Algeria) I post reviews over at http://www.thatssojacob.wordpress.com among other things…come over and play? I’ve been reading your posts. I just wanted to let you know that… I love your posts (specially book reviews). But now I have a love/hate relationship with this blog. You have so many awesome book recommendations I really have no idea where to start. Suppose someone asked you for a book that you consider to be vital to someone’s intellectual education or advancement as a human being, what book would that be? Or just a book that you could not live without. Thank you! Come by often and all the best for your writing and the year! I stumbled upon your blog while reading articles on Saramago. Very pleasantly surprised. I’ll be sticking around for a while. As a Canadian guy from Toronto, I have absolutely NO idea where to start with African women writers, as we don’t hear a whole lot about them over here (nice to see you have our Alice Munro on your nightstand). What, in your opinion, would be a good jumping-off point? hi iam glad i found you. iam togolese and though i like reading i much focused on francophone literature more especially female writers. ur blog is kind of an opening door to english writers. u ar doing a reali great job!!!!! Thank you. I’ve been away from this blog hence my tardiness in acknowledging the award. Oh I forgot to say a reading blog for my bookstore “Barnicles” is in the works apart from the website but if u love african movies you can stop by 3yr long running blog http://www.AfricanMovieReviewer.com – search keyword pacesetters (or google miss tilii pacesetters) , to read my whole listing of pacesetters books. Thanks everyone. Let’s encourage our african youth to read more and watch less TV. I just love to read so much. Growing up in ghana all I read were books by african writers especially pacecetters. Pacesetters novels are so hard to come by now. In my last visit to ghana I noticed children are spending more time watching tv emulating the west (mtv, bet etc) than reading like use to in the 80s. I use to read at least 3 books a week. This has prompted me to open a bookstore (and stationery) in osu accra ghana by december 2012. My long term goal is to build a chain of libraries. Please support my business by joining my facebook page “Barnicles Stationers”. A fabulous website is the works. I will comb the whole of africa and other commonwealth countries to bring the best books to my customer. If u don’t find it in barnicles tell me and give me 3 weeks to get it for u. The only help I need from your blog readers tell me some of your favourite african writers and the title of their books. Last question is is there some kinda tradeshow in africa for all african writers and publishers if not I’d like to collaborate with an interested party to create such. Here in the states I always attend tradeshow and its so well organised I wish africa had such for our writers and authors. I am training to teach in a primary school in London. I was helping a ten year-old girl with her poem, and she really didn’t seem to be getting it. No matter how much I talked about what poems looked like or sounded like, she wrote hers down like prose. I asked her where her family came from. Ghana. And I asked her about Ghanaian poetry, thinking that this exercise would make more sense if the material weren’t written by a dead white man. She wasn’t sure, but said that her mother had written one for her sister (I’d like to see this, but don’t want to pry). And here I am on Sunday morning, thrashing around for something to take into school, a poem to show to a bright, articulate child: Ama Ata Aidoo’s poetry came to mind, but I am at a loss as to what I should pick. Any ideas? Please check your inbox. I’ve sent you an email in reply to your query. Thanks for coming by and leaving a comment. I have a great interest in literature by African authors, most especially by women. Currently I am reading “I Do Not Come to You by Chance” by Adaobi Tricia Nwaubani. This is my second time reading it, this time on my Kindle. I love the that the author uses humor to deal with some very serious issues. I look forward to reading your blog for more suggestions. Another good read is “The Secret Lives of Baba Segi’s Wives”. The author’s first name slips by me but her last name is Shoneyin. An interesting glimpse into the lives of four women living in a polygamous situation. Thanks for the visit and for the comment. I’ve read and reviewed both books. I hope you stop by often and that my reviews and other bookish thoughts are useful to you. Happy reading! Link up itualive.blogspot.com. He comments on current Nigerian affairs and reviews music and books. Lovely blog. Would u permit reviews by others? I am very excited to have stumbled across this blog. Definitely bookmarking and becoming a regular reader. I’m very encouraged to see other people interested in African literature and sharing their reviews online. I’ve also bookmarked your blog. Thanks for stopping by. Hi Kinna, this is a fantastic blog. I’m not sure what Ghana’s like, but here in Nigeria it’s difficult at times to find a bookstore with a good selection of books. How do you get your books? My TBR list is about to triple in size!!!! Thanks for your kind words and for stopping by. It’s also a struggle to find good books in Ghana . I get my books from bookstores in Ghana (university bookstores are good for African literature and the classics). I have a huge mountain of books to read that I had shipped to Ghana when I returned home. Of course, I’m also quick to request books from people who travel outside the country as well. One needs to employ a variety of tactics to get good books in West Africa! wow you are from Ghana. I am going to wander around your blog for some time now and see if i can find any books to add to my wishlist. Nice blog. I am so happy to have discovered your Blog. And I’m glad that you left me a comment. Please subscribe and come back often. Thanks for dropping by. Oh, this is definitely a sign – my parents are travelling in Africa at the moment, and I’ve just been thinking that I should read some good African writing so I can vicariously share their trip! East Africa rather than west, but let’s not get too hung up on technicalities. I’ll read your blog with interest. PS. What a gorgeous banner – I love those rich, earthy colours! For East African fiction: I’m currently reading Wizard of the Crow by Ngugi wa Thiong’o and loving it. I also recommend Tropical Fish by Doreen Baingana. Between the Canadians, the Australians and the Africans, we book-bloggers are doing a great job of promoting Commonwealth literature, if I do say so myself! Yes we are. We are doing more than the Commonwealth Foundation! It’s really wonderful. So right! I’m South African and only now (thanx to you) getting acquainted with so many new and exciting writers! So glad I got to “meet” you! I’ve been looking for a blog with a focus on African writing, and now I’ve found it! Oh, I’m glad because I’ve been following your blog and its focus on Australian literature. Thanks for stopping by. Great site. Look forward to reading some more. Thanks. I love your blog too. Thanks for stopping by. Glad to have found you – even though it did take me a while! Sorry about that. Oh, no need to apologise. I’m happy that you managed to stop by. Any more book bloggers in Ghana or in other African countries that you know of? I’m tying to put together a list of African book bloggers. Me too. I thought I was the lone book blogger in Ghana. Wow Kinna. Africa has always been a place I have been dreaming of visiting – and the selection of literature you have from African literature is mind boggling. I have Ngugi Wa Thiongo’s Petals of Blood lined up to read, but I haven’t because it’s like a box of chocolates – sometimes you just like to know its there before it gets over. And we in India always struggle to come across these amazing African writers. And oh! A beautiful beautiful blog. And we in Africa struggle to find Indian books. There should be more cultural exchange between countries of the Commonwealth. Thanks for stopping by. I like your blog: its tasteful and honest. And oh, i am a book lover too. I read whenever i can make time for it! But obviously you are a much more extensive reader. Would love to have your opinion. Thank you for the compliment. And thanks for dropping by. Make more time for reading! Just found this page. Looking forward to learning and sharing. My favourite book by a black female writer: Their Eyes Were Watching God by Zora Neale Hurston. Great book. Thanks for stopping by. yes, I loved this book too – and unfortunately lent my copy to someone and never got it back. Hmmm…I love to keep my books. I’ve stopped lending books that I love out. They simply never make it back home. Yes I do. My favorites are Nawal el Sadaawi, Ama Ata Aidoo, Mariama Ba, TsitsiDangarembga, Bessie Head, Adichie. I currently reading Yvonne Vera’s The Stone Virgins and its really good. Thanks. I’ve only heard of a couple of those. I’ll keep an eye out for them. I appreciate the honesty in your profile and I enjoy the selection of books I will be following you!